Facebook has launched Facebook Live, a new official live streaming channel from Facebook headquarters in Palo Alto. Facebook Live will let viewers watch special events, new feature launches and guest interviews. Facebook Live is more of a channel dedicated to the happenings at Facebook as opposed to being a platform for others. 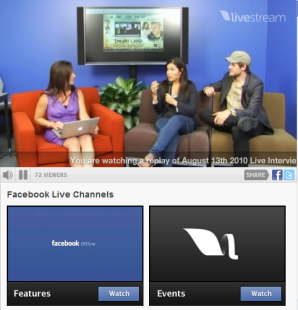 The video is powered by Livestream and the video player comes with options to share on Facebook or Twitter, as well as an embed option.